As everyone with a computer knows, the web is shoulder-deep in brokerages, services, and publications that promise to help you invest just like the pros. That’s no surprise. It’s a logical step in the democratization of information. On a technological landscape where anybody can become a self-made journalist, filmmaker, or detective, what’s stopping anyone from becoming an armchair investment whiz? The availability of bargain-basement commissions on trades, broad access to research, and specialized trading platforms make it seem like Wall Street’s advantage over the individual investor has never been more negligible. The only problem is, all those bells and whistles can obscure the fact that there’s still a big difference between what professional traders can do and what individual investors can—and should be doing. 1. Individual investors have an awful track record with short-term trading. 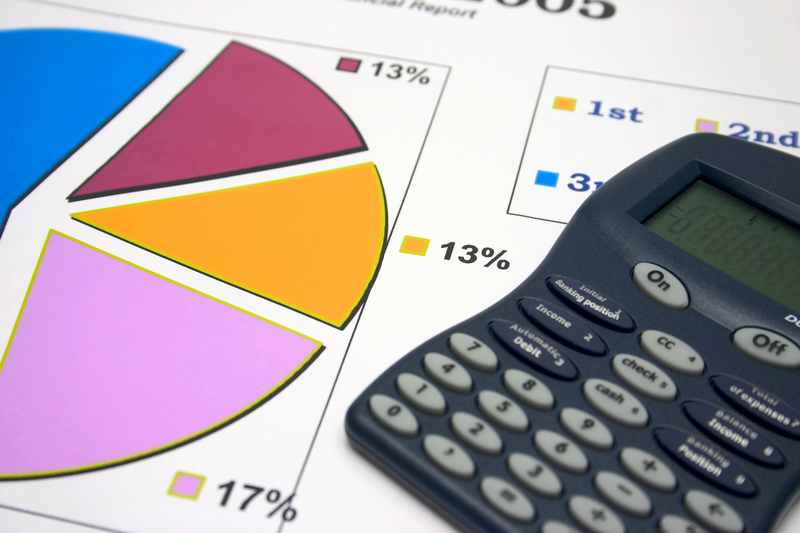 There is research suggesting that different tactical strategies can improve returns. Nonetheless, the performance history of individual investors clearly demonstrates that the majority of investors would be far better off by avoiding short-term trading and just consistently investing. 2. Your tools are no match for the pros. The short-term behavior of markets is complex and there are thousands of highly-paid PhD quantitative analysts and MBAs spending all of their time figuring out how to gain an edge. These people have lots of time and limitless computer power at their disposal. The idea that a nifty new charting tool can somehow help you to beat these people is naive. 3. You need to win in the long-term not the short-term. Professional traders focus on the short-term because they are judged and compensated based on recent performance. Many probably realize that short-term trading has low odds of success, but that is the field in which they compete. Individuals need to perform well in the long-term and don’t need to try to compete for short-term results. 4. Being a savvy consumer doesn’t make you a savvy investor in consumer stocks. Peter Lynch famously advocated that people should ‘buy what they know.’ If you are an avid Facebook user and you see the growth potential, this might be a good reason to invest. On the other hand, stocks of companies with great products often trade at very high prices relative to earnings. 5. Excessive short-term trading can leave you with a huge tax bill. As detailed in last week’s blog, selling an investment that you’ve held for less than a year at a profit triggers short term capital gains, and you want to avoid that as much as possible. That’s because short term gains are taxed as ordinary income, while long-term gains are taxed at lower rates. For investors in the highest marginal income tax bracket, taxes on long-term capital gains top out at 20%, but short-term capital gains can reach 39.6%. 6. It’s tough to know the difference between skill and luck. Almost everyone who lived through the .com bubble that ended in 1999 remembers people who thought that they were market whizzes because they owned tech stocks when the market was rising and went ‘all in’ on the tech boom. The true test of expertise was choosing to get out when market levels reached ridiculous highs. When you keep making winning bets in a rising market, it’s easy to convince yourself that you are a savvy trader. Individual investors with a DIY approach can achieve superior results. With an up-close-and-personal eye on such issues as risk tolerance, cost, and tax consequences, individual investors may in fact be uniquely positioned to look after their own best interests. The key is in understanding what kind of investing will work best for you. Investing for the long term with a steady, consistent hand is in your best interest. Trying to compete against Wall Street is not. This entry was posted in Active Investing, Investors, Long-term investing, Market Timing, Risk, Stock Investing, Taxes, Tools and tagged capital gains tax, investment expenses, investors, Peter Lynch, professional traders, short term gain, stocks on October 28, 2014 by Kateri Young. With U.S. equity markets near their record highs and a bull market run that is starting its sixth year, the potential for a correction is a growing concern. In addition, U.S. equity prices look fairly high when viewed in terms of the PE10 ratio. Another factor that concerns some market watchers is that volatility (as measured by VIX) is at very low levels, reminiscent of 2007. This type of complacency has historically been followed by increasing volatility, as levels return to their historical average, accompanied by a sell-off in higher-risk assets as investors adjust their portfolios to mitigate the effects of higher volatility. Investors seeking to remain invested in equities at a target level but who want to reduce their exposure to market swings and to mitigate the impact of a rise in market volatility have historically been well-served by increasing their allocations to low-beta market sectors. In this article, I will review the defensive value of low-beta allocations as well as examining the consistency of beta over time. Beta measures the degree to which a security or a portfolio responds to a move in a benchmark index such as the S&P500. A portfolio with beta equal to 80% (also written as 0.8) tends to go up 0.8% when the market rises 1.0% and vice versa. Beta may be thought of as showing whether a security amplifies the moves in the benchmark (beta greater than 100%) or damps the moves in the benchmark (beta less than 100%). The SPDR Select Sector ETFs provide a convenient way to break out the sectors of the U.S. equity markets by dividing the S&P500 into nine sectors. 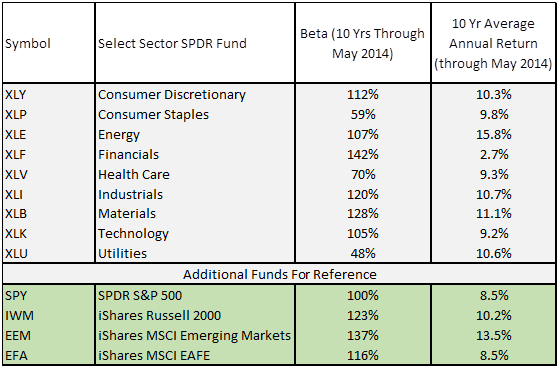 These sectors illustrate how much beta varies. The S&P500 has a beta of 100%, by definition. Some readers may be surprised that emerging market stocks have beta of almost 140%, which means that emerging market equities tend to go up (down) 1.4% for every 1% gain (drop) in the S&P500. Even before the market crash of 2008, emerging market stocks were high beta—this is not a new phenomenon. There are three U.S. equity sectors with betas well below 100%: consumer staples (XLP), healthcare (XLV), and utilities (XLU). It is often believed that low-beta equities have very low average returns. In fact, a well-known but now widely-discounted model of equity returns (the Capital Asset Pricing Model, CAPM) assumes that beta of an equity or asset class corresponds directly to expected return. High-beta asset classes have high expected return and vice versa. Low-beta equities have historically substantially out-performed what would be expected on the basis of CAPM, however, and the past ten years is no exception. These three sectors have all out-performed the S&P500 over the past ten years. The return numbers shown here are the arithmetic averages, including reinvested dividends. The first question that is worth asking about beta is the degree to which beta corresponds to losses in really bad market conditions. 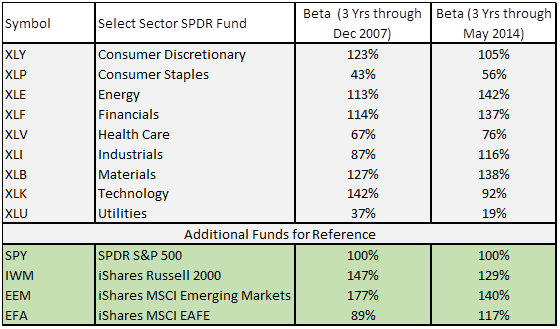 In the table below, I have tabulated beta calculated using three years of data through 2007 for each of the funds above, as well as the returns for each of these in 2008. The three sectors with the lowest betas going into 2008 (consumer staples, healthcare, and utilities) had an average return of -22.3% in 2008, as compared to -36.8% for the S&P500. An equity tilt towards these lower beta sectors could have reduced losses in that year. The astute reader may notice that the betas calculated using ten years of data through May of 2014 (shown in the first table) are, in some cases, quite different from the betas calculated using three years of data through December of 2007 (shown in the second table). Beta varies through time. The betas calculated using three years of data through May 2014 provide an interesting contrast to the three-year betas through the end of 2007. We are looking at two distinct 3-year periods, separated by almost six and a half years and, in general, low-beta sectors at the end of 2007 remain low-beta today and high-beta sectors back then are still high-beta. 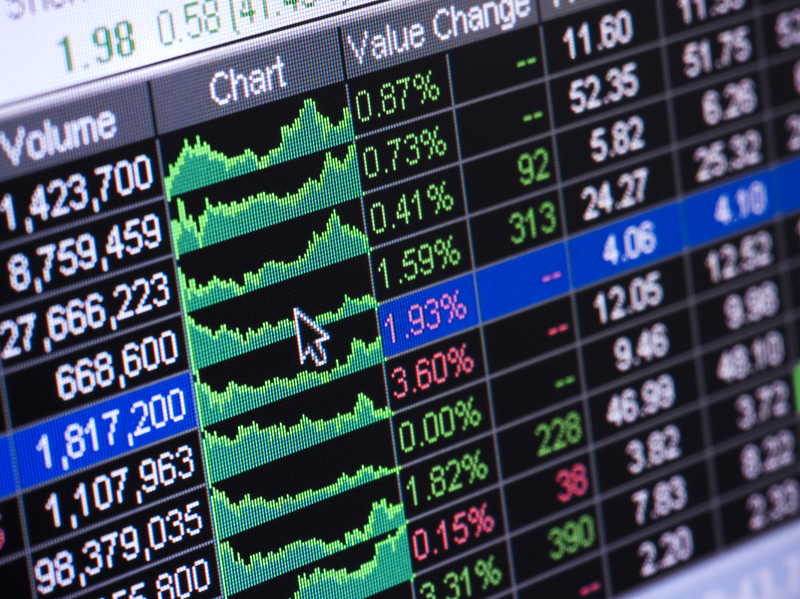 The two most notable exceptions are international equities (EFA) and the technology sectors (XLK). 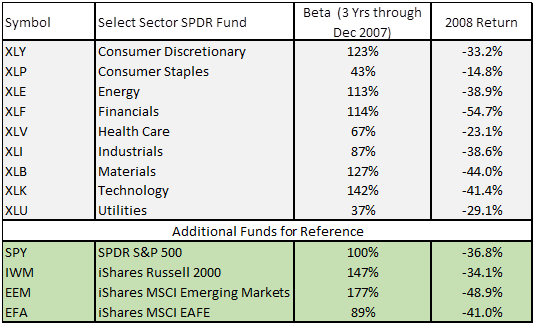 These changes notwithstanding, the three sectors with the lower betas in 2007 also have the lowest betas in 2014. 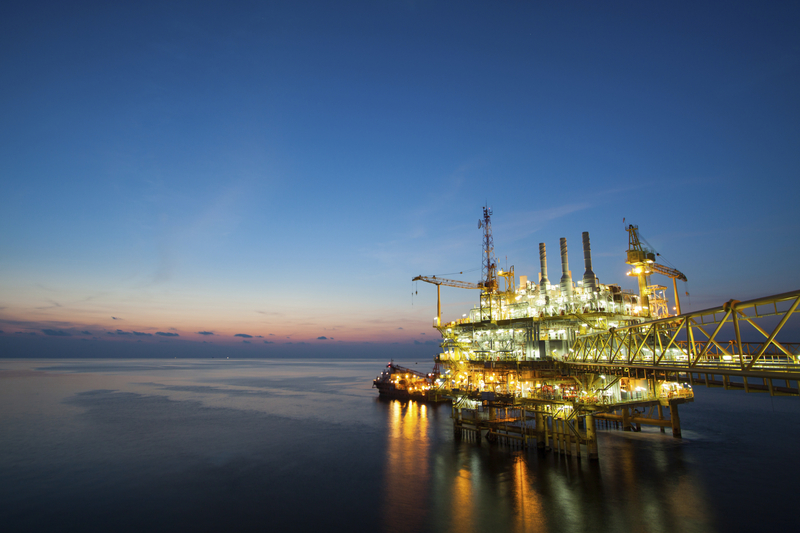 There are a number of factors that will determine whether any sector will weather a broad market decline better than others. Beta is one important factor, but there are others. In 2008, the financial sector suffered disproportionately large losses—well beyond what would have been expected on the basis of beta alone. The underlying drivers of the 2008 market crash were most severe in the financial sector. Small-cap stocks, by contrast, fell considerably less than the beta value of this sector would have suggested. Low-beta asset classes have historically provided some protection from market declines and increasing volatility. 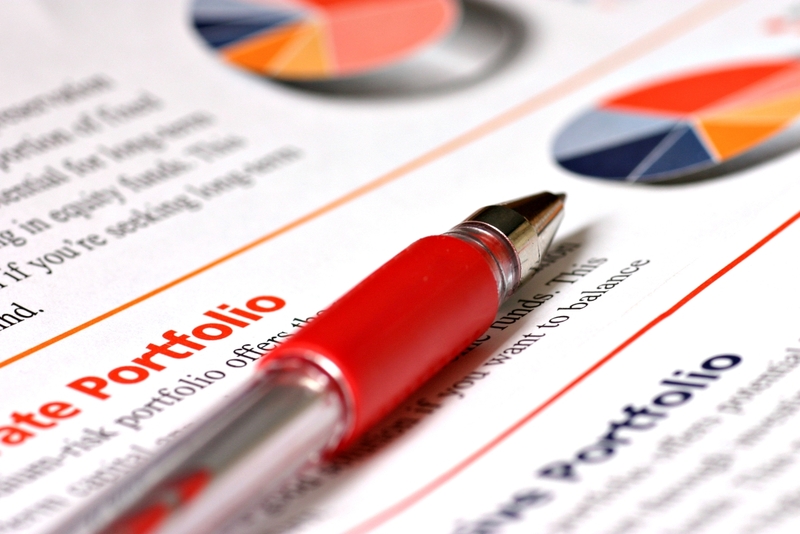 There are a range of other considerations that potential investors should consider, however when creating a portfolio. The selection of individual asset classes should be made with consideration of the characteristics of the total portfolio, including desired risk level, interest rate exposure, and income generation. 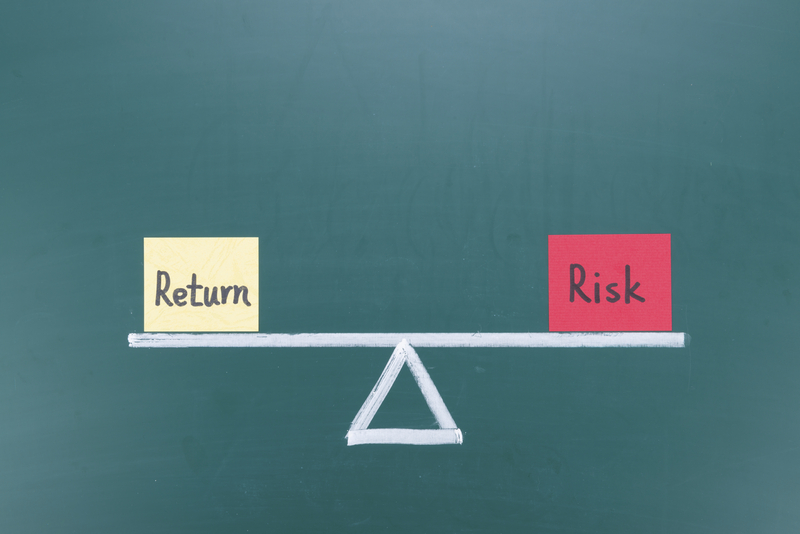 The target for total portfolio beta is primarily determined by an investor’s total risk tolerance. A target beta level can be achieved both by choosing how to allocate the equity portion of a portfolio among sectors and by varying the balance between equity (stocks) and fixed income (bonds) investments. Fixed income asset classes tend to have very low—even negative—values of beta. In my next blog entry, I will explore these two approaches to managing beta at the portfolio level. History suggests that low-beta sectors can provide some protection from market downturns. 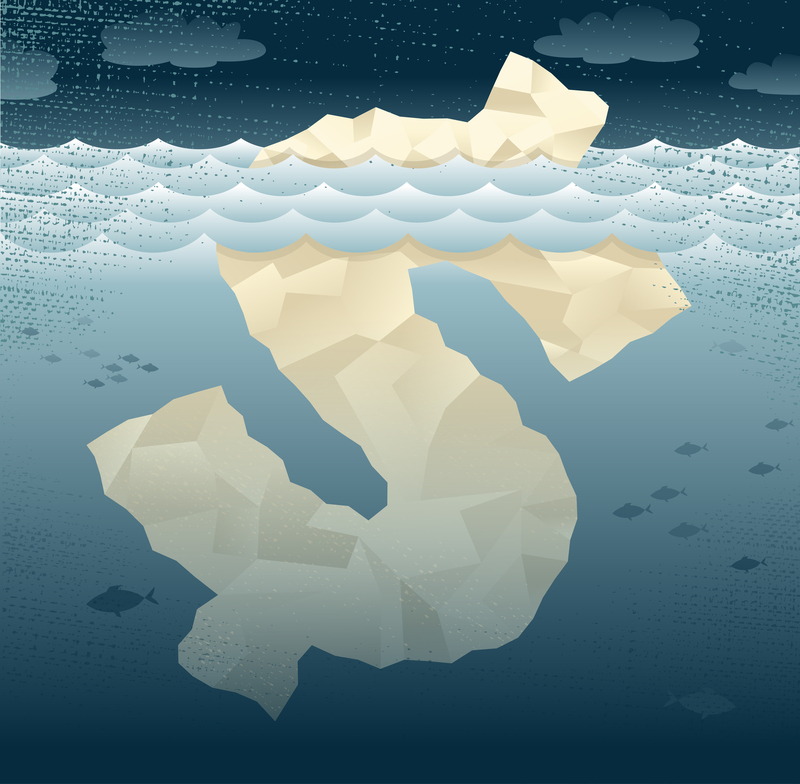 The length of the current equity rally, and the substantial increases in equity valuations in recent years, are motivating some investors to consider their best defensive alternatives to protect against the inevitable reversal. The question for investors to ask themselves is whether they are best-served by reducing portfolio beta by reducing their exposure to equities, by shifting some portion of assets from high-beta to low-beta sector, or both. This entry was posted in Asset Allocation, Diversification, Economy, financial planning, Market Outlook, Market Timing, Risk, Stock Investing, Volatility and tagged asset allocation, Beta, CAPM, consumer discretionary, consumer staples, diversification, economy, energy, financials, health care, industrials, investing, investing strategy, iShares MSCI EAFE, iShares MSCI Emerging Markets, iShares Russell 2000, low beta market sectors, materials, S&P 500, technology, utilities on June 30, 2014 by Geoff Considine.